US2020 is a new organization developed from a White House call to generate large-scale, innovative solutions to science, technology, engineering, and math (STEM) education challenges in the USA. 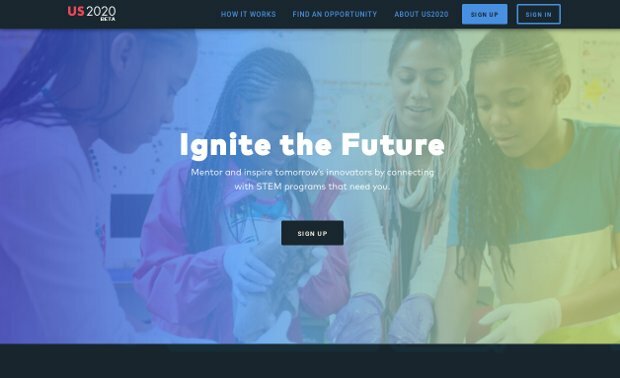 Announced by President Obama at the 2013 White House Science Fair, US2020’s mission is to dramatically scale the number of STEM professionals mentoring and teaching students through hands-on projects with a focus on serving underrepresented communities – girls, underrepresented minorities, and low-income children. Their goal is to match 1 million STEM mentors with students from kindergarten through college via youth-serving nonprofits by the year 2020, creating millions of moments of discovery — life changing events when students conduct experiments, build model rockets, and program robots. In fact, by 2022, the U.S. will need more than nine million STEM professionals. Current projections indicate there will be a significant shortage of qualified professionals to meet this need. Providing quality access to STEM education and careers to all children — especially underrepresented and underserved children — is an economic and social justice imperative for the United States. A stronger and more inclusive STEM talent pipeline is directly linked to the country’s broader challenge of unequal opportunity.